Crystalpunk is a rally cry for people to come together and start making all sorts of weird things, things slightly of kilter that need a crystalpunk to have its delights appreciated, things that are radical but hurt nobody. Other people, professionals, are making things too. In art, in architecture, in computer science, in biology, crystalpunks want to share in their excitement, often feeling it more than they do, but understanding it through reverie not formalism. At socialfiction.org we have been thinking about gargoyle computation automated search & gargoylisation not optimisation, software as a crystal ball automata as discrete little worlds that hide complex operations creating a universe to be discovered by its users, pattern formation your fingers on your closed eyelids & press gently, non conventional computing based & sea based, unintentional intelligence wildtype adaptivism of BacterioPoetics. 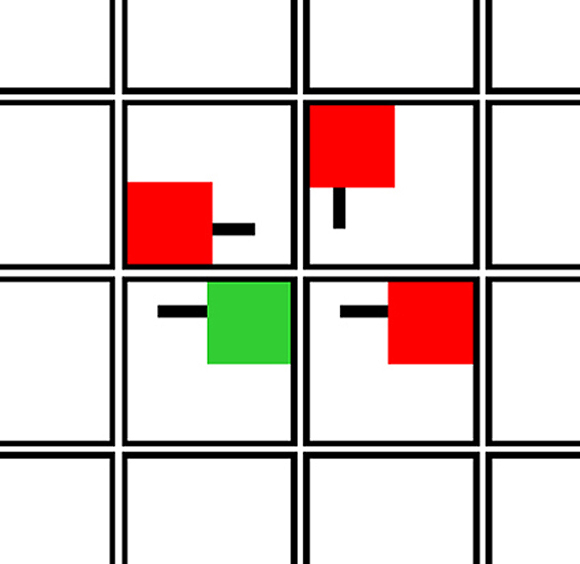 Somewhere in the middle we started writing a chain-reaction automaton: on the GUI a Grid, inside it rectangles are activated to rotate one step, activating others to rotate one step of 4 on close contact. The crystalpunk can interact with it: creating patterns, signalling it and monitoring its output. But the rules that guide its movement are mind boggling gargoyly. Can it Compute? Can it loop forever? These and many other questions are to be explored during this workshop. The script we have made is a sloppy bit of Python code and in this workshop we invite you to make things patterns, logic gates, literature, self-destructing embroidery forms on top of it. Please bring your computer if you have one.